Since the age of 5, actress Rowan Blanchard has seen the ins and outs of media. From starring in TV show “Girl Meets World” (2014-2017) to landing a role in Disney’s award-winning movie “A Wrinkle in Time”, she has been a prominent figure in teenage media and the youth film industry. More importantly, coming out to her fans as queer in 2016, she is a role model to LGBTQ+ teens all around the world. 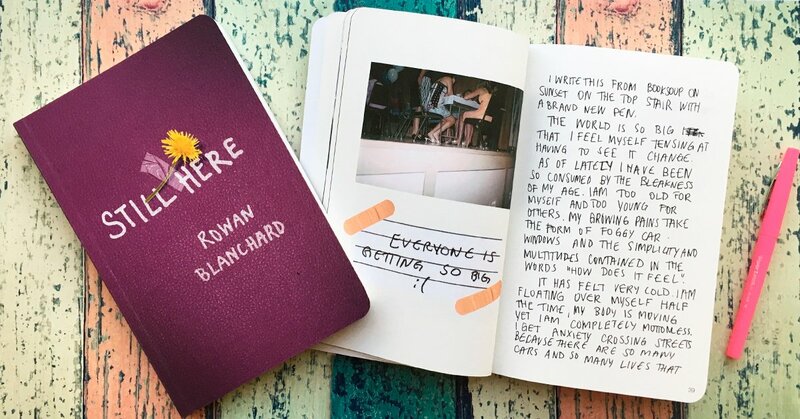 Now at the age of 16, Blanchard has become an author and published her first book entitled “Still Here” – an inspiring memoir filled from cover to cover with raw diary entries and personal photos capturing the essence of adolescence. Although this book is mainly written by Blanchard, teenagers who share similar views on adolescence have contributed their own photos and pieces of writing. Additionally, authors that have been selected by Blanchard such as Rupi Kaur and Jenny Zhang have contributed their unique perspectives on being a teenager. Crafted like a scrapbook, photos and pieces of writing have been taped in using materials such as tape, glue, and even band aids! From cutouts to diary entries to flowers on every page, this book has more to what’s seen on the page than just a variety of authors and photographers. As a photographer, writer, and developing teenager myself, I can say that this book is definitely something that teenage girls who struggle with self acceptance and finding their place in the world should read. Even in some of the pages, Blanchard directly addresses the reader as “you”, forming this special, unique connection with the reader. In an interview with W Magazine, Blanchard states, “The response from my teenage friends was, ‘This is exactly what I feel. How did you capture exactly what I feel? I’m crying.’ The adults called me crying and said, ‘What if my teenager was this sad and had this many complicated feelings and I shut them down and I didn’t listen?’”. The contents of “Still Here” capture the smallest fragments of teenage life but the message behind each page is inspiring and relatable to all ages. The most interesting part of this book is towards the end. After a certain amount of pages, the book’s pages become blank. The pages are still numbered, but there is nothing written. When I first saw the blank pages, I was confused. But when I flipped to the Index where it listed the contributors to her memoir, the authors of the last pages were “You”. I realized that this was where I could add my own personal touches to the book. This was such an interesting addition to her memoir because it allowed me to contribute to the book myself, which let me to express myself and jot down my own experiences and paste in my own photos. In the interview with W Magazine, Blanchard said, “I don’t view [“Still Here”] specifically about being about being a teenage girl. It’s just about growing up, whenever that is…I do feel like that time is so accessible… so much of our culture is so based in what it means to be a teenager.” Blanchard then discusses being exposed to the #MeToo campaign and women’s oppression through social media in the interview and explains how her opinions and ideas on these historical events have influenced the beautiful pages of the book. Blanchard and her touching memoir have inspired teenagers like me to express myself in ways I thought I couldn’t. By revealing her personal yet universal life experiences, she reminds us that us girls, women, and many others are ‘Still Here’. This article is not sponsored by Rowan Blanchard.